I have written before of conductor Anthony Gabriele’s love affair with the movies. The Italian has an innate understanding of matching the nuance and tempo of a score to performances played out both on stage and screen. So to turn up to the Barbican Hall on February 14th and see Gabriele conduct the London Concert Orchestra in a Valentine’s Evening concert of Movie Classics, was quite the romantic treat. Gabriele’s programme spanned most of the 20th Century. A nod to the pre-war great movie composers saw the evening open with Tara’s Theme from Max Steiner’s Gone with the Wind and what was to become immediately evident was that opening up these legendary scores to the full acoustic treatment of a live symphony orchestra, imbued them with a passion and a texture that only enhances their music. The evening’s pieces were segued with carefully researched introductory comments from the Maestro, telling us for example that Steiner along with Erich Korngold and Alfred Newman were the three composers responsible for establishing the cultural bedrock of movie scores. 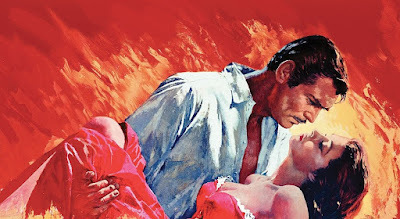 The programme referenced them both with Korngold’s Love Scene from the 1938 Errol Flynn classic The Adventures of Robin Hood and Newman’s timeless Cathy’s Theme from the Laurence Olivier starring Wuthering Heights (1939). The first half closed with Mei Yi Foo performing Rachmaninov’s Piano Concerto No.2 in C minor. Gabriele had previously explained that the “Rach” has been used in scoring no less than 8 feature films to date – however his evening of Valentine’s romance chose David Lean’s take on Noel Coward’s timeless and quintessentially English romance from 1945, Brief Encounter. It’s a movie that is well worth the (re-)viewing – Celia Howard and Trevor Johnson capturing the essence of love through masterful acting. Though a further revelatory (even if culturally mundane) moment in the Barbican Hall came half way through the concerto’s second movement, when I realised that the Adagio sostenuto was in fact the inspiration for Eric Carmen’s All By Myself, covered by Jamie O’Neal and then, briefly, on screen by Renee Zellweger, in the multi-franchised Bridget Jones’s Diary. The concert would not have been complete without a nod to Italian influences and hence the inclusion of Ennio Morricone’s Cinema Paradiso. The movie’s melody is exquisite and one can only long for the day when Gabriele and his friends at Raymond Gubbay assemble a night of film music dedicated to l’italianità. Amongst other romantic gems on offer, were a double header of John Barry, truly one of the UK’s greatest film scorers with Gabriele conducting Somewhere In Time and Out Of Africa and Henry Mancini’s mellifluously mellow Moon River from Breakfast at Tiffany’s – with marvellous alto-saxophone work from Chris Caldwell. Similarly, Philippe Schartz trumpet work in Francis Lai’s Love Story was hauntingly wonderful, while Nigel Bates’ non stop work on the snare drum for 15 minutes (yes, 15!) was a feat that was as much a display of stamina as of musical excellence and proved a stunning climax to the evening’s programme – before the thunderous applause demanded a much deserved encore of Craig Armstrong’s theme from Love Actually.